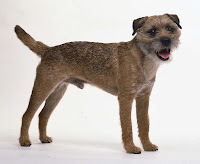 Border Terriers emerged near the Anglo-Scottish border in the Cheviot Hills area. It was initially bred as fox and vermin hunters and to be a farm worker, thus sharing ancestry with Dandie Dinmont Terriers and Bedlington Terriers. They were also used to hunt otter, badger and marten. Presently though it is quite a rare breed, it is still used to hunt vermin on farms and is regarded to be a friendly companion but owners of the breed.